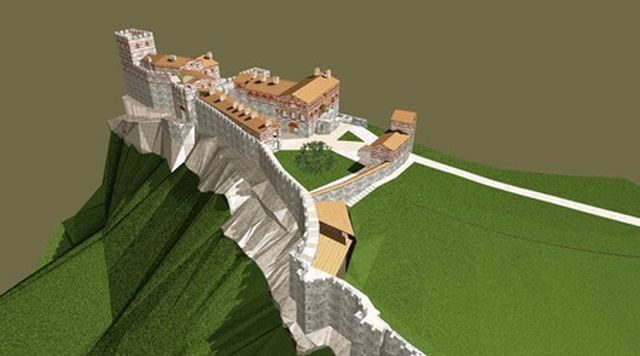 Bulgaria’s Council of Ministers has granted the northern Veliko Tarnovo Municipality management rights for the Trapesitsa Hill, which together with the Tsarevets Hill is one of the two fortresses of the inner city acropolis of Tarnovgrad (today’s Veliko Tarnovo), the capital of the Second Bulgarian Empire (1185-1396 AD). The management rights for Trapesitsa will be held by Veliko Tarnovo Municipality for a period of 10 years allowing the local authorities to “carry out activities related to the preservation and promotion of the historical site, organize scientific, cultural, educational, and tourism activities under the auspices of the Veliko Tarnovo Regional Museum of History, and to seek EU project funding”, explains the press service of the Bulgarian government. The decision appears to be in preparation for the partial archaeological restoration of the Trapesitsa Hill Fortress, a controversial project which will be funded with EUR 1.2 million by the Heydar Aliyev Foundation of the government of Azerbaijan. The Bulgarian government has been criticized by independent journalists for accepting a donation by the Foundation because of the human rights and media freedom record of Azerbaijan’s President Ilham Aliyev, while some NGOs have criticized the plans for the restoration of several archaeological structures over their “hastiness” and “lack of transparency”. In another similar decision of the Bulgarian Cabinet, it has granted the District Governor of the northern Pleven District management rights for 10 years over much of the archaeological preserve of the Ancient Roman city of Ulpia Oescus near Bulgaria’s Gigen. The main job of the Pleven District Governor will be to oversee the conservation, restoration, and exhibition in situ of Ulpia Oescus, which is one of the largest and best preserved Ancient Roman city in Bulgaria, in order to develop it as a cultural tourism site. For more information about the history of both the Trapesitsa Hill Fortress in Veliko Tarnovo, and the Roman city of Ulpia Oescus in Gigen check out the Background Infonotes below. The Trapesitsa Hill is one of two main fortified historic hills in the medieval city of Tarnovgrad, today’s Veliko Tarnovo, in Central Northern Bulgaria, the capital of the Second Bulgarian Empire between 1185 and 1396 AD. Together with the Tsarevets Hill, Trapesitsa was one of the two fortresses of the inner city acropolis of Tarnovgrad (Veliko Tarnovo). The Trapesitsa Hill is a natural fortress on the right bank of the Yantra River, and is surrounded by it on three sides. It is located northwest of the Tsarevets Hill. The Trapesitsa Fortress had four gates, the main one being its southern gate, which was also connected with the Tsarevets Fortress with a bridge across the Yantra River. There are two hypotheses about Trapesitsa’s name. The first one is that it comes from the Bulgarian word “trapeza” meaning a “table” or “repast”, possibly referring to the receptions of the medieval Bulgarian Tsars; the second hypothesis is that the word comes from “trapezium” because the hill is in fact is a trapezoidal plateau. The largest preserved church on the Trapesitsa Hill known as “Church No. 8” is named after the 10th century AD Bulgarian saint, St. Ivan Rilski (St. John of Rila) (876-946 AD); it was surrounded with other buildings which are believed to have been part of a monastery complex. It is known that in 1195 AD, Bulgaria’s Tsar Asen I (r. 1189-1196 AD) transported the relics of St. Ivan Rilski from the city of Sredets (today’s Sofia) to Tarnovgrad (today’s Veliko Tarnovo), and had them placed in the specially constructed church on the Trapesitsa Hill. The Bulgarian archaeologists believe that a room in the southern part of Church No. 8 was the reliquary for St. Ivan Rilski’s relics. The relics of St. Ivan Rilski (St. John of Rila), who is Bulgaria’s patron saint, were kept in Veliko Tarnovo until 1469 AD when they were transported to the Rila Monastery where they are kept to this day in what became a major event for the Bulgarians during the early period of the Ottoman Yoke (1396-1878/1912), as the Second Bulgarian Empire had been conquered by the invading Ottoman Turks in 1396 AD. The numerous and richly decorated small churches indicate that the Trapesitsa Hill harbored the homes of the medieval Bulgarian nobility, the boyars, and the supreme clergy. More recent excavations, however, also indicate that the imperial palace of the early Bulgarian Tsars from the House of Asen (the Asen Dynasty, r. 1185-1257 AD) was in fact located on the Trapesitsa Hill, and the imperial seat was possibly moved to the nearby Tsarevets Hill only later, during the reign of Tsar Ivan Asen II (r. 1218-1241 AD). In the recent years, the Trapesitsa Hill has been excavated by Prof. Konstantin Totev from the Veliko Tarnovo Branch of the National Institute and Museum of Archaeology of the Bulgarian Academy of Sciences, and by Prof. Hitko Vatchev from the Veliko Tarnovo Regional Museum of History. The Ancient Thracian, Roman, and Byzantine city and fortress Ulpia Oescus (also known as Palatiolon or Palatiolum) is located near the town of Gigen, Gulyantsi Municipality, Pleven District, in Northern Bulgaria, about 5 km south of the point where the Iskar River (whose Roman name was Oescus) flows into the Danube. It was originally an Ancient Thracian settlement from the Late Bronze Age and the Early Iron Age. In his work “Geography” in the 2nd century AD, Greco-Egyptian ancient geographer Claudius Ptolemy (ca. 90-168 AD) described Ulpia Oescus as a city of the Triballi, the independent Ancient Thracian tribe which inhabited today’s Northwest Bulgaria. In the 1st century AD, Oescus grew out of the military camp of Roman legions Legio IV Scythica (“Scythian Fourth Legion”) and Legio V Macedonica (“Macedonian Fifth Legion”) set up next to the Thracian settlement. It was founded as a Roman city in 106 AD by Emperor Trajan (98-117 AD) in favor of his victory over the Dacians north of the Danube. What is more, it was founded with the status of a colony of Rome, the highest status for a city in the Roman Empire. In today’s Bulgaria, there are only three Roman cities which enjoyed this status – Colonia Ulpia Traiana Ratiaria, Colonia Ulpia Oescus near Gigen, and Deultum (Colonia Flavia Pacis Deultensium) near Burgas. Ulpia Oescus thrived economically and culturally in the 2nd-3rd century AD as major city in the Roman province of Moesia Inferior during the Nerva-Antonine Dynasty (r. 96-192 AD) and the Severan Dynasty (r. 193-235 AD). However, in the 3rd century AD, this happy state of affairs was put an end to by the barbarian invasions from the north of many barbarian tribes including the Goths. The city recovered during the reign of Emperor Constantine the Great (r. 306-337 AD) when the first permanent bridge on the Lower Danube was constructed near Ulpia Oescus. The so called Constantine’s Bridge on the Danube was 2.5 km long (1.3 km over the river), 5.7 meters wide, and was the largest river bridge in ancient times. It was opened on July 5, 328 AD, in the presence of the Emperor himself. According to historical sources, it existed from 328 AD till ca. 355 AD when it was destroyed by a barbarian invasion. It connected Ulpia Oescus with Sicudava (today’s Corabia, Romania) on the northern bank of the Danube. In the first half of the 5th century AD, Ulpia Oescus suffered from the invasions of the Huns. In 444 AD, it was conquered by the Huns under Attila who tried to turn the city into a Hun settlement, the only Hun settlement on the territory of today’s Bulgaria, under the name Hunion (which turned out to be short-lived). Its fortress wall was rebuilt during the reign of Byzantine Emperor Justinian I the Great (527-565 AD) but the entire city was destroyed in 585 AD by the barbarian invasion of the Avars, not unlike many Late Antiquity cities all over today’s Northern Bulgaria. At the end of the 6th century AD, it was settled by the Slavs. In the 10th AD, a settlement from the First Bulgarian Empire (632/680-1018 AD) was founded on top of the ruins of the Ancient Thracian and Roman city of Oescus. It existed until the 14th century, the end of the Second Bulgarian Empire (1185-1396 AD) but its name remains unknown. After the cities destruction by the invading Ottoman Turks, its surviving residents were moved to today’s town of Gigen. The archaeological excavations of Ulpia Oescus have revealed that in the 1st-2nd century AD the city was populated by Thracians and settlers from the Italian Peninsula, the Western Roman provinces, and Asia Minor (judging by the discovered Latin inscriptions, among other things). The initial territory of the city called by the archaeologists “Oescus I” includes the urban center, city square, and public buildings; it covers of an area of 180 decares (app. 44.5 decares), while the eastward expansion of the city called Oescus II has an area of about 100 decares (app. 24.7 acres). Thus, in the Late Roman Oescus had a total territory of 280 decares (app. 69 decares), which roughly equals the area of other major Roman cities in Central Northern Bulgaria – Novae near the Danube town of Svishtov, and Nicopolis ad Istrum near the town of Nikyup, Veliko Tarnovo District. Ulpia Oescus had typical Roman urban planning – with a rectangular shape and streets oriented east-west and north-south. About one third of the city was occupied by public buildings, and remainder – by workshops and homes, with its population estimated at about 100,000 inhabitants at its height. During their excavations in the late 1940s, Bulgarian archaeologists discovered a large public building containing one of the most impressive colorful Roman floor mosaics in Bulgaria, dated to the time of Emperor Septimus Severus (r. 193-211 AD) which features a scene from “The Achaeans”, a lost play by Ancient Greek playwright from Athens Menander (342-291 AD). The play was identified by an inscription reading “Achaeans by Menander”. It was unknown until this discovery at Ulpia Oescus in 1948, which was confirmed in 1961 by a papyrus from Oxyrhynchus in Egypt containing an alphabetical list of Menander’s works. The scene shows three masked man and one without a mask. According to Bulgarian archaeologist Teofil Ivanov, Menander based this play on Book I of Homer’s Iliad, on the quarrel between Agamemnon and Achilles over the damsel Briseis. The other two men are Nestor, King of the island of Pylos, who tries to reconcile the men, and Patroclus (unmasked), Achilles‘ friend who accompanied him to the ships of the Myrmidons after the quarrel. The Achaeans mosaic is kept today at the Pleven Regional Museum of History. The archaeological excavations have also revealed the city’s forum, the temples of the Roman deities from the Capitoline Triad – Jupiter, Juno, and Minerva, a large basilica, thermae, and other public buildings. The Ulpia Oescus Fortress had thick and tall stone walls with fortress towers. It was partly destroyed in the 5th century AD by the Huns, and rebuilt under Byzantine Emperor Justinian the Great. Probably the most interesting ancient building is the Temple of Fortuna, the Roman goddess of fortune and luck built in 190-192 AD with funding provided by Roman Emperor Commodus (r. 161-192 AD); it was painted in red, and had white columns, and was 22 meters tall. The statue of Fortuna discovered in its middle is kept today at the National Institute and Museum of Archaeology in Sofia. The temple of Fortuna was not destroyed after the adoption of Christianity but was walled up; however, it was shattered by an earthquake at the end of the 6th century AD. At least five Roman Emperors are known to have visited Ulpia Oescus, including Emperor Hadrian (r. 117-138 AD), who even served there as a legatus, a senior officer. Another interesting building found in Ulpia Oescus is the so called civic basilica, a public building with judicial and business functions. It was 105 meters long, and was surrounded with caryatids, sculpted female figures serving as architectural supporting pillars. The ancient ruins near Bulgaria’s Gigen were first connected with the city of Ulpia Oescus at the end of the 17th century by Italian military engineer Count Luigi Ferdinando Marsili (Marsigli) who was seeking for the location of Constantine’s Bridge. The first archaeological excavations of the Roman city of Oescus were carried out in 1904-1905 by Czech-Bulgarian archaeologist Vroclav Dobruski, Director of the then National Museum of Archaeology in Sofia. The next excavations were conducted in 1941-1943 by Italian archaeologist Antonio Frova. In 1947, the archaeological exploration of Ulpia Oescus was continued in 1947 by Bulgarian archaeologist Teofil Ivanov with a team from the National Institute and Museum of Archaeology of the Bulgarian Academy of Sciences, and the Regional Museum of History in the northern city of Pleven. Since the 1980s, Ulpia Oescus has been excavated by Assoc. Prof. Gergana Kabakchieva from the National Institute and Museum of Archaeology. In 1965, Bulgaria’s government declared Ulpia Oescus a monument of culture of national significance, and in 2011, the Ministry of Culture granted it the status of an archaeological preserve.